Yesterday I realized that despite having lived more than 15 years in Japan, I can’t tell the difference between a plum blossom and a cherry blossom. Even more shockingly, my Japanese wife, and many other Japanese people can’t either. They both come in a wide variety of colors, and both blossoms have five petals each. 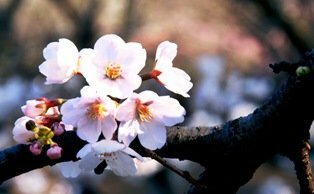 Of course sakura (cherry blossoms) and ume (plum blossoms, or more accurately, Japanese apricot) do bloom at different times, so if you see them in February you know they’re probably plum blossoms, and if you see them in April, they’re probably cherry blossoms. There are some plum blossoms still on the trees now, though, and there were early-blooming cherry trees a few weeks ago, so it’s not always easy, and you often see them misidentified on various websites and blogs. 2. 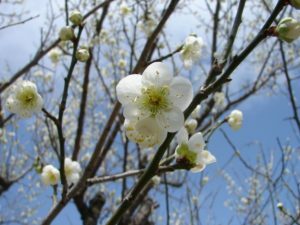 Plum blossoms tend to be round, whereas cherry blossoms are oval, and tend to have a little indentation at the top of the petal. This is my son Matthew enjoying some early-blooming cherry blossoms called higan zakura in Ueno Park yesterday. By the way, these photos (except the last one) come from the excellent freeimages.com website, an excellent place to find free photos on the Web. ** Sorry, originally I had posted this photo as an example of cherry blossoms that are off the branch. I have been informed in the comments section, however, that they are actually cherry-plum blossoms. Not all plum blossoms grow on the branch, so you have to be careful. PS. I’ve recently been asked if I have a picture or a Japanese Cherry Blossom Tattoo, and actually, I do! Check out the picture in the article “Diary of an Ex-Yakuza Moll”. Editor’s note: this post was originally published in March 2010 and has been updated. I love blossom. Always makes me feel more hopeful. Spring is here! I didn’t even know that Plums blossomed! Very helpful! I never thought of the difference before. Thank for the blog. I always wondered and now seeing the stems on the cherry blossoms it is easier to identify. I LOVE these flower blossoms and the photo of your son is adorable! I vote for Cherry Blossoms! Good post. It is good to learn something while blog surfing. Thanks – I’d always wondered at that difference! That was a very fascinating post, and lovely photos too! I’ll add you to my blogroll and be sure to keep reading! Oh wow. I’d never tell the difference. Both are beautiful though. I’m going to Japan in May, and I can’t wait! I love Japan so much. Actually I will be going to Tokyo on Saturday so can’t wait to see the sakura blossom for the first time ever. Hopefully by then its still there..
Oh and your son is very cute.. I love all kind of blossom. Your post is so inspiring. The Kenrokuen Garden currently has a lovely display of ume blossoms. The cherry blossom forecast predicts we’ll see the first sakura blossoms on March 31st in Kanazawa. Thanks for the help in distinguishing sakura from ume. I have always loved cherry, plum, and apple blossoms. It made me so happy today when I opened up Word Press to see such beautiful pics on your blog. Thank you. So beautiful! Nothing like that here in Hawaii. oow.. seriously that’s very beautiful :)..
those are beautiful. i was actually wondering about the difference. i just want to clip them and take them inside but i never do!! what do the japanese eat to make them the healthiest people on earth? At this time, in my garden (center Italy) I only have plums in flower, cherry blossom will come later on. Actually I was used since long time just to look at the color … while there are many other differences. Great post, and nice photos, too! I always just based it on the time of year they were blooming. I never thought about how to tell the difference visually. Thank you for letting us know the differences between the two tree blossoms. I have both kinds in my yard and I am going to take a closer look at them when they begin to bloom this spring. ohh! that is so nice! I’ve always loved the cherry blossoms, but never knew there is something called plum blossoms.. they both look fascinating! Lovely pictures of the blossom. 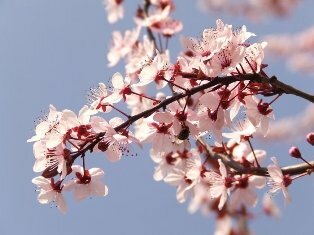 I live in Spain and we are into Almond blossom time as well as Cherry and wild plum. Almond blossom was late this year but has been beautiful in our area of Spain, which hasn’t suffered from the bad winter that some parts of Spain have had. isn’t your son gorgeous! i lived in Osaka about 10 years ago and I loved cherry blossom time (and momiji, and winter and summer come to think of it). Lovely. The cherry blossoms are so sweet. I’ve capture some too. As you illustrated spring time in Japan next time you may illustrate autumn in Japan. You know those colourful leaves. I haven’t yet found that colourful in any other places. Does somebody know that colourful equal to Japan or better than? Thanks for the info. I didn’t even know plum blossoms existed until I watched about it in a Korean drama. Now that I think of it, maybe I had seen plum blossoms before, but I had mistaken them with cherry blossoms. Great topic for a blog, such detail (: love the images as well, especially the one of the shadow moving across the face, just delightful. Gorgeous photos. I’ve just been for a long drive on a grey wet day and it has been a joy to see even a picture of blossom. I really like the last picture. Thanks ! for the jappanese this is the season wich is related to the Shunbun no hi or, for us european “beliwer”, the Εαρινή ισημερία (equinozio di Primavera) a pagan wicca to pay tribute to Eostar patron goddess of fertility. Beautiful pictures, this is the first time I visit this blog, I allowed myself to let me notify next posts. Thank you for this post. They are both beautiful flowers and now I will be able to tell the difference. I think I just generalize them both as cherry blossoms so this was helpful! Beautiful pictures. Interesting post. Thank you for sharing them. Wanted to thank you again for sharing these photos, both the borrowed and your own. I had wondered about the difference in the blossoms as well, so that tidbit of information was a lovely little “a-ha” from you. Enjoy your sakura season. It is one of my desire to plant a cherry blossom tree here in my backyard, I just don’t know if it will grow here because of the hot temperature. I’ve always wonder what’s their difference because they look the same from afar.Now I understand. Thanks for sharing! we have a garden of both, the beauty and the aura they create is just mind blowing. great post wow, must say you are a very creative person. I love cherry blossoms. Never knew the difference either or for that matter, that plums actually blossomed in the same way. Sweet picture of your little boy! So wonderful flowers 🙂 Very beautiful…….. Interesting article and nice photos! Thanks also for including the free photo web source. I have painted cherry/apricot blossoms on some of my ceramic work for many years. I did notice that some grow from little stems while others are on the big branches. Also, that there arean’t usually leaves and blossoms at the same time! really want to see the real ones ><"
I thought I was the only one who didn’t know the difference! I am glad that it is so tricky to tell the difference because I thought I should have known better having lived in Japan for four years. Your pointers are great – will try and put them in to practice next time I come across a blossom. I believe that another big difference between the two is the length of time that the blossom survives. Plum blossoms tend to be stronger and last longer, whereas cherry blossoms are very fleeting and I think it is this fact which captured the Japanese romantic and poetic nature hence they have cherry blossom viewing but not plum blossom viewing. this is very true. In Chinese culture the Ume blossom is part of the trio “The 3 friends of Winter” because of how well it holds up(the other two being pine and bamboo I believe). The Sakura is portrayed, rightly so, as being so soft and delicate. Thanks for the insightful guide on cherry blossoms and plum blossoms. These are one of my favorite types of flowers besides hydrangeas Beautiful to get married under the Sakura Trees. 100% fan of cherry blossoms!!! 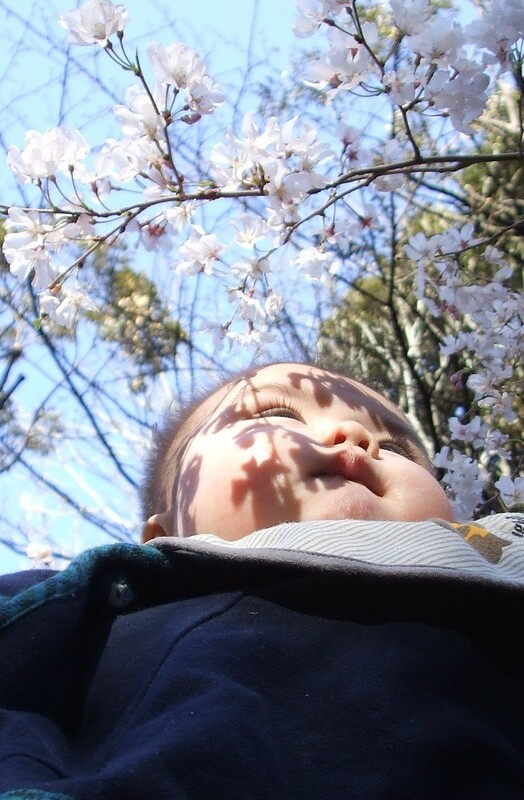 …love the photo of the baby and blossoms! Thanks! although i may be getting cherry blossoms confused with another tree? i remember visiting a temple near Biwako and the same thing happened – the petals were falling off and it was like being in the middle of a pink snow fall. it was so pretty! Thanks for the lift – loved this. The plum has just bad luck, that his “birth-day” date it is too early in the year to sit outside on a plastic blanket! Let’s fight for equal rights for the plum blossom! What a beautiful post to welcome spring. Not only are your pictures wonderful but you’ve helped solve an ongoing mystery for me. Thank you. Great post! I have a Ume blossom branch tattoo(the website is a link to my flickr photo of it)-and every time people see it(I’m in America) they compliment me on my beautiful cherry blossom/sakura tattoo. I used to correct people, now I don’t bother. However when I went to Epcot and visited ‘Japan’ all the workers there told me how pretty my ume blossom turned out 🙂 I think the biggest thing to look for, as far as illustrations go anyway, is the double pointed tips of the cherry blossom. In real life it can be a little trickier. It’s a very ‘cute’ story! Interesting details. Bloosom is one of my favorites. But i didn’t know any information like that. Great post! I’ve always loved the cherry blossoms ! I love seeing the cherry blosssoms when I have visited Tokyo in April. They especially look nice in Ikebana. Couldn’t sleep on a layover in Narita and discovered some gorgeous blossoms outside. Thought they might be really early blooming cherry blossoms but now know that it was the plum blossoms that stood out from the night. Thanks for the excellent blog post. I adore the picture of you little boy. He is SOOO cute! Check out my blog at http://lediarunnels27221219.wordpress.com/. It’s entitled: “Mysterious Japan”. I think you might like it. Wow, thanks for sharing this, it’s just what I need. I’ve been long wondering how the cherry blossoms differ from the ume. This was very helpful. Also, can you I know around what month do they usually bloom in Japan? BTW, that cute baby against those pretty blooms is picture perfect! Keep posting. Plum blossoms usually bloom in April. In Tokyo and Osaka, they bloom around the end of March. Down south, of course, it’s a couple of weeks earlier, and in colder places like Hokkaido, they sometimes don’t bloom until the end of April. The child in the last picture is so lovely. What lovely blossoms they are. Plum blossoms earlier than cherry does. 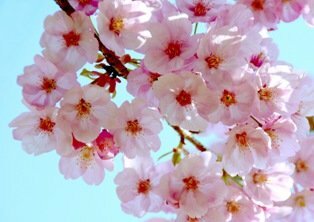 Plum blossom is Chinese national flower, while cherry Japan. Now how do you tell the difference between the apple blossom?! What a great post! This is very helpful to me as I am trying to identify old photographs of flowering trees! Thank you so much! since the plum blossom actually originates from China personally, i think Chinese plum or mei flower would be a better “more accurate name” for it. lot of things from it abot blogging. thanks.